My mother, Dr. Mildred Pratt, died in 2012. I think about her often. This year, I published her autobiography: A Black Woman’s Journey from Cotton Picking to College Professor: Lessons about Race, Class, and Gender in America. 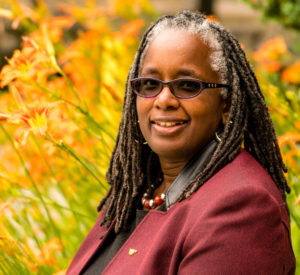 She was one of the first-generation of Black women to become a full professor at a predominantly White institution. When she became a full professor in the 1970s, Black women represented 1 percent of all full professors. As of 2016, Black women, like me, represent 2 percent of all full professors. In fact, out of all the full-time faculty in degree-granting postsecondary institutions, Black women only represent 3 percent of all faculty. We need more. The faculty journey is a long one. A four-year undergraduate degree; a five- to seven-year graduate degree; seven years as an assistant professor; another five to seven years as an associate professor; and then, finally, almost 25 years later, you become a full professor – a member of the elite in the academy – a sacred and often exclusive space and place of older White men. It’s lonely with so few of us speckled amidst White men whose power and authority enables them determine the rules of the game on the playing field of education. White men who often seek and find their “academic sons” to reproduce and perpetuate what bell hooks calls the “imperialist White supremacist capitalist patriarchy.” The academy is full of powerful White men who perpetuate the disciplinary dogma and creed, who determine the curriculum and what can be taught, what can be valued, what can count towards tenure, what journals are the best, and what scholarship goes in the journals. These White men – many of whom have led and continue to lead secret, private, cloistered lives in the walls of the academy, their bodies occupying libraries, and their heads in books – rarely look up into the world of life. These “leaders” in the academy are often disconnected from reality, lost in lectures they have recited, resuscitated and regurgitated for decades, with ways of thinking no longer relevant to reality. These supposedly “great minds” often fail to recognize that they themselves cannot be hired with the criteria that they themselves have created for replacing and replicating themselves, designed to exclude “the other” but often excluding almost all. To change this reality, we need to more young Black girls, like Mildred, who make it – in spite of it all. Mildred, a young Black girl, who at the age of 10 had been raped by her brother, yet became the valedictorian of her high school class, while working as a maid to support her mother and two younger sisters. Mildred, a young Black girl who couldn’t be named the class president because she was a girl, though the class president was always the valedictorian. Mildred, a young Black woman who endured the humiliation of a teacher publicly laughing at her coat – tattered and torn because of poverty. Mildred, a young Black woman who was often hungry, because the family had no food; a young Black woman raised without a father, because he was often in jail; and a young Black woman whose own mother never finished 6th grade. Ultimately, she was a young Black woman who made it in spite of it all; a young Black woman who climb out of poverty, racism, segregation, sexism and discrimination to influence over 1000 students in her social work classes as a professor. There are many Mildred’s still out there. Young women of color and women of promise and potential seeking to blast and bust down barriers and barricades through schools like Bennett College – a small Black all-girls school struggling to maintain its accreditation. Bennett is fighting for legitimacy and validation by the very system designed by the “imperialist White supremacist capitalist patriarchy” to suppress and hide the key of knowledge. We need Bennett because we need more Black women’s journeys. We need women of color in the academy. This April, at Virginia Tech, almost 500 women of color will gather for an annual conference that supports, empowers, enriches, encourages and engages women of color in their own development and pursuit of knowledge. It reminds women of color of their power. It reminds women of color of their potential. It reminds women of color of the power of education. It reminds women of color that their journeys matter. We need more Black women’s journeys – in spite of it all. Dr. Menah Pratt-Clarke is vice president of Strategic Affairs and Diversity and Professor in the College of Education at Virginia Tech.